Anton Musical Teddy Bear by Steiff. This beautiful hand made piece, in antique beige mohair, wears the white ear tag, signifying this item as a Steiff limited edition, together with the famous gold plated Button in Ear. Limited edition of only 1225 pieces worldwide. ANTON TEDDY BEAR “Hark the herald angels sing – Glory to the Newborn King!” Whenever Anton Teddy bear hears this time-honoured melody, it warms his little heart. Softly he rocks his head, which is loosely attached to his body, and dreams of taking his trumpet and playing the melody himself. But he has never been able to do so before. And so Anton is happy when his music-box rings out and gently whisks him away. 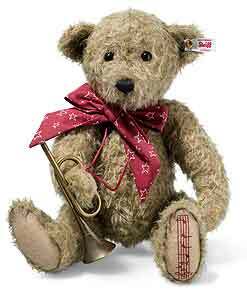 Fitting for the Christmas season, the musical bear is wearing a bow adorned with stars, a pretty ribbon holding his trumpet in place. He has music in his soul – and even on his sole, in the form of matching coloured notes! Anton is the ideal companion for people who also love his song and want to dream away with him.